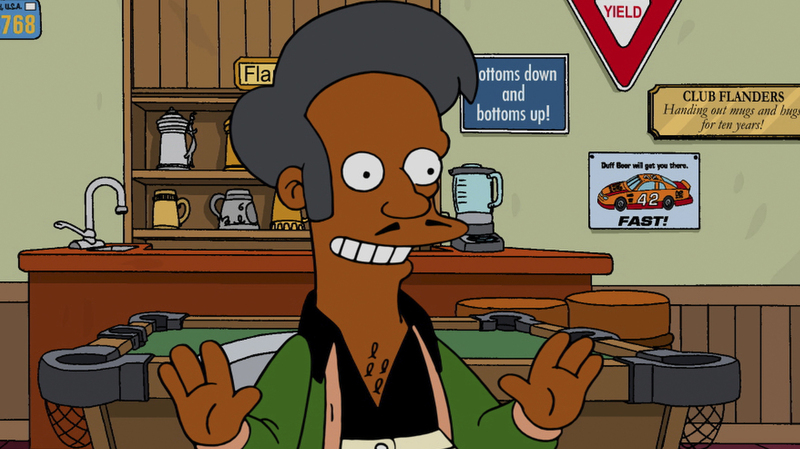 'The Simpsons' To 'The Problem With Apu': Drop Dead The Simpsons addressed complaints about its caricature of an Indian convenience store owner by making clear that it ... doesn't really care. Apu is a supporting character on The Simpsons drawn in broad caricature, and Sunday's episode addressed — sort of — criticisms about the portrayal. Comedian Hari Kondabolu made a documentary in 2017 called The Problem With Apu. It's not very long — less than an hour. In it, he interrogates the legacy of Apu, the convenience store owner on The Simpsons voiced by Hank Azaria. Kondabolu talked to other actors and comics who longed for more South Asian representation, only to find that at the time, Apu was just about all there was. And Apu was not only voiced by a white actor, but he was doing what Azaria has acknowledged is a take on Peter Sellers doing an Indian accent in the movie The Party. In other words, he based his caricature of an accent on someone else's caricature of an accent. Or, as Kondabolu said on W. Kamau Bell's show Totally Biased, "a white guy doing an impression of a white guy making fun of my father." Sunday night, The Simpsons offered what is apparently its best effort at a response. In one of the plotlines, Marge tries to read Lisa a book she loved as a little girl and realizes it's full of racist stereotypes. In an effort to share the book with Lisa without passing along the things she finds offensive, Marge revises the book and brings it back to Lisa. "It takes a lot of work to take the spirit and character out of a book, but now it's as inoffensive as a Sunday in Cincinnati," Marge announces. Marge has changed everything in the book so that nothing in it can bother anyone, which involves making the central character so perfect that, as Lisa instantly announces, "there's no point to the book." Marge asks what she's supposed to do. This comparison is utterly dishonest, of course, for a multitude of reasons. Apu is not the central character of The Simpsons, and it's absurd to suggest that the fabric of the show will be unwound if he doesn't continue to be the same caricature he is. His existence at the periphery — his very flatness, and his definition as a bag of signifiers meant to scream "INDIAN!" is integral to what it means to write a racist stereotype. It's galling that writers will force a character to exist as funny scenery and then complain that they cannot change him without upsetting the emotional arc of the series. Furthermore, Apu is not appearing in a 50-year-old book by a now-dead author. Apu is a going concern. Someone draws him, over and over again. Azaria makes money to keep imitating Peter Sellers imitating an Indian man. Scripts are still being written. What if Marge were confronted not with reading Lisa an old book, but with reading a new book in the same series that continued to embrace the same racist portrayals it did 50 years ago? Is Marge really supposed to relax and read Lisa a new racist book because she loved an old racist book? The idea of processing art in its own context while still recognizing its flaws is a delicate act. Consider Molly Ringwald's recent essay about the early John Hughes movies in which she appeared. She has affection for them, and for Hughes, but she knows what realities they reflect. Movies exist; they are fixed pieces, and you can approach them from a lot of angles. But there's no grandfathering in of a character or a franchise, as The Simpsons seems to suggest, such that you can't complain about new material written for a stereotyped character because he's been a stereotyped character for almost 30 years. It gets worse. After Marge asks what she's supposed to do, Lisa — Lisa! — looks directly at the camera. "It's hard to say," she says. "Something that started decades ago and was applauded and inoffensive is now politically incorrect. What can you do?" And she looks at a framed photo next to her bed of Apu, which is signed, "Don't have a cow. Apu." Marge puts a hand on her shoulder. "Some things will be dealt with at a later date." "If at all," Lisa responds. Both look blankly at the audience. So Lisa, the show's unshakable crusader for justice, including in matters of popular culture, has been reduced to a mouthpiece for the lazy idea that asking for better representation is an unfair burden on creators; an unreasonable demand that things be "politically correct." That is regrettable, to say the least. But what really reveals the blind spot at issue here is the idea that Apu was once "applauded and inoffensive." The writers equate what they have heard with what has been said, and they equate what has been said with what has been felt. The fact that they have managed to ignore the criticism of Apu until recently doesn't mean that Apu was inoffensive and is now offensive — or, as they prefer to say, "politically incorrect." It means that they were doing exactly what they've been accused of doing: They were stereotyping people who had very little access to opportunities to loudly object. What is entirely missing from this response is any recognition of the effects on the people who find themselves not represented, or represented poorly — and they were at the center of Kondabolu's documentary. He went out specifically to speak to South Asian performers about how they felt about representation in American television, and specifically about Apu. Kal Penn tells Kondabolu that he hates Apu, and for that reason, doesn't like The Simpsons. A room full of comics says that Apu was referenced as part of their school bullying. Aziz Ansari says he was taunted about Apu while driving with his father. Actor Maulik Pancholy feared encountering an Indian person in a convenience store for fear his friends would launch into their Apu impressions. Even the former surgeon general, Dr. Vivek Murthy, talks about his experiences with stereotypes. The entire focus of the story of Marge is what a reader with nothing at stake should do about the social obligation they feel to look like they're not racist. It's how to balance their affection for art with their own principles — undertaken entirely from a position of great privilege. There is no attempt to reckon with what the book Marge loved might have meant to girls who found themselves taunted with imagery from it. It's as if the show can only process complaints about Apu as nicks on the finish of its legacy. The human beings at issue go largely ignored. I know: It's a cartoon. That is the easiest, silliest response to this debate. It's just a cartoon. It's just a comedy. Or, as the photo of Apu pointedly says, don't have a cow. But the show doesn't have this defense to call on, because it has accepted accolades for decades as a thoughtful, intelligent, satirical work that deserves to be taken seriously. It has accepted a Peabody Award, and a GLAAD Media Award. It has been praised and slobbered over and quoted and praised again, and to plead insignificance at this point is unavailing. "Dealt with at a later date. If at all." In other words: We have heard how we have hurt people, and we honestly don't care.